An investment in real estate in Panama gets help in Casco Viejo. San Felipe district. It is an area in transition, where impoverished neglect rubs shoulders comfortably with opulent splendor. Signs like this pepper walls in Casco Viejo as reclamation project offers opportunities for investment in real estate in Panama. This is the site of the second Panama City, after much of the first was destroyed in 1671 by fire during a raid by notorious English pirate Sir Henry Morgan. 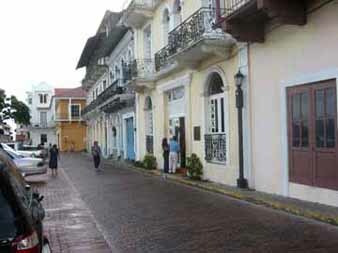 What is now known as Casco Viejo was inaugurated in 1673. On a headland at the western end of what is now a modern city center, it was more easily defensible. Today, it seems like a quiet oasis removed from the lavish skyscrapers across the bay in the horn-blaring financial district. The wealth of the Americas poured through here, en route to Spain, when the new city was founded. This old mansion, next to the National Theatre, is typical of restoration projects for sale from $200,000. 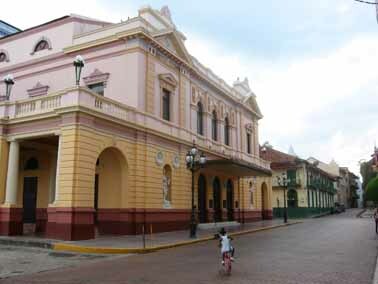 Panama's National Theatre, just down the street from the potential restoration project above. Rich merchants built impressive mansions with spacious wrought iron balconies. As is the case with most cities, success brought growth, and Panama grew beyond its defending walls. 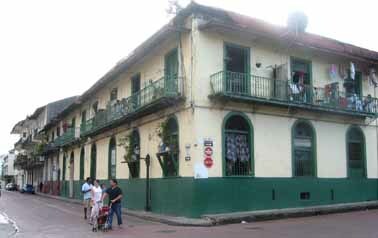 Many of the Spanish colonial buildings of present-day Casco Viejo fell into disrepair and ruin. Homeless squatters moved into some of them, and many remain there today. Genuine opportunities to invest in real estate in Panama exist in these red brick streets that contain the presidential palace, the National Theatre, the French embassy, statued squares of all sizes, intricate churches, gourmet restaurants, façades that are no more than screens for the rubble hiding behind them, crumbling cathedrals and dark slums down narrow streets no sensible person would walk at night. A restored street glistens in the sun. The white building in the distance is part of the presidential palace. Casco Viejo, declared a UNESCO heritage site in 1997, is being reclaimed and turned once more into an upscale residential and tourist area. 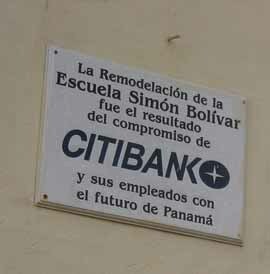 And that means opportunities to invest in excellent real estate in Panama. Those opportunities are particularly good until August 2007, when special rehabilitation incentives expire. If an investment in real estate in Panama is in the cards for you, this is a great time and an excellent place to make a profit.